It’s finally time! The enormous free Redux expansion for the Windows, Mac and Linux version of Sublevel Zero is now live, including full VR support for Oculus Rift and HTC Vive! Sublevel Zero Redux brings a remastered campaign, difficulty modes, new enemies and unlocks, and much more. As the definitive version of the game we couldn’t be more excited to get it to all of you. It’s a great moment to finally get all of this content out there, and to have the VR version done! It was back in 2014 that we first had the inspiration for this game, and it wasn’t long before we were dreaming big and imagining how awesome it would be on the (not-even-out-yet) Oculus Rift DK2. It’s been a long road, as covered in previous posts, and we’re so glad to have delivered something we’re proud of. If you’ve not bought the game already, or know someone who might want to, check out the main page for links to buy from a store of your choice! Intended to familiarise new and existing players to the game. It’s shorter and easier to introduce the core game mechanics. Once completed, the regular campaign is unlocked. We’ve introduced difficulty modifiers that scale to a variety of different player skill levels and affect enemy health, drop rates, crafting costs and Nanite life. This provides an easier introduction, with an even tougher challenge for veterans. As you progress, harder alternate levels unlock that add more challenge as you improve. 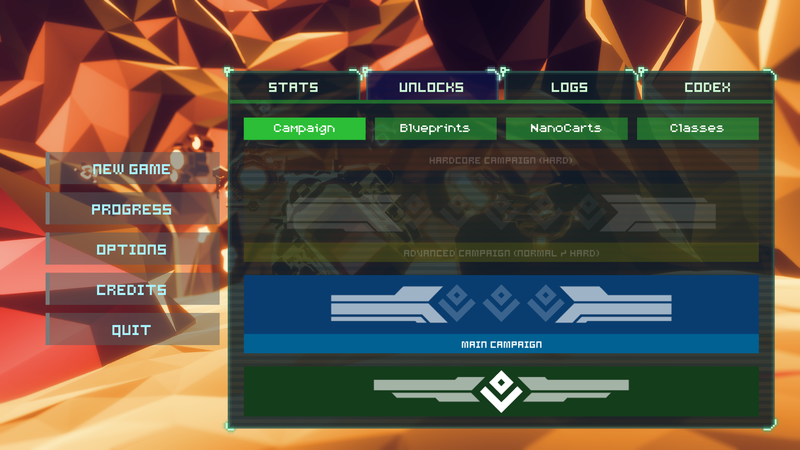 You can track your progress through the game on the new Campaign Progression tab on the menu. We’ve added over 70 new rooms to further expand the game and add more variety to levels. To reduce backtracking, Teleporters are now available at certain points to help you get back onto the critical path through levels. We’ve created two brand-new enemies that add deadly new twists to combat. Progressing through the game will unlock harder variations of existing enemies. These guys take more hits and punch back even harder, adding another layer of difficulty for the most experienced pilots. By destroying enemies, this unlocks trophies in the Codex tab. Each entry gives you more information about different enemy types as well as their strengths and weaknesses. The Seeker class is specifically designed for players to take advantage of homing weapons such as the Homing Swarm and Smartgun right from the start. It’s also perfect for VR players. The Reaver is an experimental ship bolted together by a dangerous madman. Even rumoured to indulge in cannibalism, his regard for the safety of others and himself was legendarily lacking. Leaving mid-game now gives you the option to continue from the start of your current level. One thing to note is that Hard difficulty modes disable this feature. Full support for Oculus and Vive. 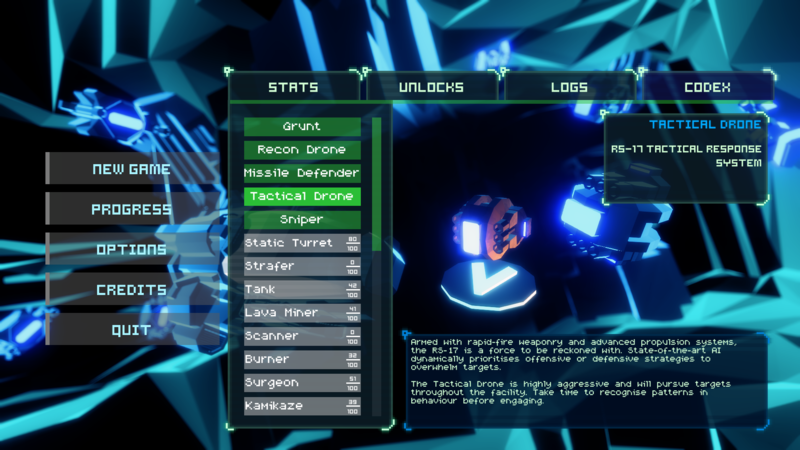 Weapons such as the Smartgun, Homing Missiles and Homing Swarms have lock-on capabilities which can be utilised with head tracking. There’s also a wide variety of different comfort options to suit your individual needs, including a novel “Comfort Calibrator” mode to help you quickly find the settings you want! Levels load faster and gameplay is smoother thanks to a bunch of optimisations. There’s also an option to turn on banking which adds a great sense of weight to the ship. We’ve added French, German, Spanish, Italian and Russian localisations so you can enjoy Sublevel Zero in multiple languages.